If you are looking to send the gift of unique foods, especially with an international flare, World Market is one of the most popular options. World Market was originally started in San Francisco by a world traveler that wanted to start selling shiploads of hand-woven wicker. His products attracted tourists that were drawn to the uniqueness of what he was selling and to this day, the products sold by World Market would never be described as “the usual.” In fact, they feature some of the most amazing, gourmet products, wines and concoctions that make them truly a gift basket option to contend with. Gift baskets full of personality and great food. World Market’s gift baskets are unique, but they may lack variety – especially when you hold them in comparison to other big gift basket merchants. That being said, their products come from all over the world and they offer more distinctive options than other companies can brag about. Some of the products you will find in their gift baskets include spreadable cheeses, spa items, fruits, crackers, snacks, breakfast items, coffees, teas, wines and more. The only non-edible options they have are their spa gift baskets – not pet or other non-edible baskets at this time. World Market does not let you add on to a gift basket and you cannot swap out items, but they do allow you to build your own gift basket. You will pick a theme, then select the container and items and add your final touches. This is perfect for someone that wants to pick and choose what items they want to include – such as gluten-free or Kosher options not otherwise available in a premade basket. The themes and sentiments are what you would expect from a company offering gift baskets, but the issue is the selection within each sentiment. They have limited baskets and most are created as general purpose – so they suit a larger majority of categories without being specific to one. This can be a drawback, especially if someone wants to convey a specific message without coming off too all-purpose. They do not have premade Kosher, vegan, gluten-free or sugar-free baskets. But, you can create your own using their build your own feature. World Market’s gift baskets do include all of the major holidays and they even have limited edition baskets for specific holidays – like Christmas. Surprisingly, there are no corporate or business gift options with World Market specific to their gift basket inventory. While a business could order any basket and send it, they cannot establish a corporate account, receive discounts or brand their baskets. The gift baskets at World Market are definitely higher priced than other companies – but then again, you get what you pay for. The majority of their gift basket options fall between $30 and $100 – with only a very small handful priced under $30. Those that are under $30 are not really baskets and more like two products placed together. Baskets can go as high as $250 with World Market as well. For the higher price you do get nicer packages, better quality products and fun selections. There is a flat standard ground shipping rate of $8.95. Unfortunately, World Market isn’t clear about their expedited prices and because they rely on freight shipping, you cannot do last minute deliveries, APO/FPO or even international – which is rather limiting. The items are presented great on the website. You can zoom and see what products you are receiving and they have detailed descriptions of what is in the baskets, but they do not provide the sizes of each item like some companies do. You can add a gift message to your gift baskets, but the selection of messages is rather “nonspecific” compared to how other companies work their messages. World Market may not outright promise satisfaction, but their refund policy proves they do care about the quality of products their customers receive. If someone is unsatisfied with their purchase, they can return within 60 days for a full refund with a receipt or in original condition without receipt. The only issue, however, is most of their returns focus on in-store purchases. 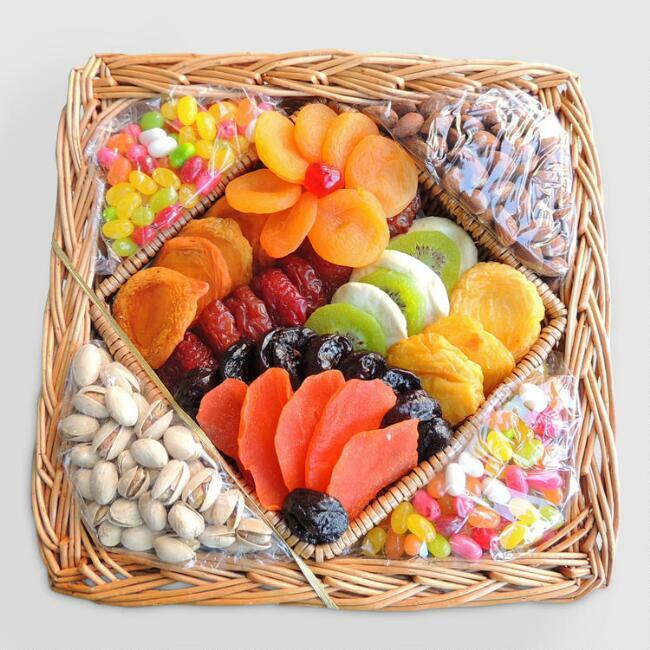 For online gift baskets they do offer exchanges, but if the item is sold “online only” – and the majority of gift baskets are, returns become more difficult and must be done through the internet department. They do offer price adjustments – so if you purchase a gift basket and within 10 days the price lowers, you can request a refund for the difference – we have yet to see any company offer that except World Market. We do wish customer service was more robust – especially for such a globally-recognized company. At this time, World Market only has their email and toll-free line. But, this line isn’t dedicated to gift baskets; instead, it applies to all products sold via World Market and there is definitely some confusion with customer service representatives if they are unfamiliar with the gift basket offerings. They do have a FAQs section, but it doesn’t all apply to gift baskets either – making it hard for people to find what they are looking for. Under $50 – The gift baskets under $50 are few and far between and most contain only a handful of items, such as a coffee cup filled with sampler sizes or a miniature cheeseboard with sample-sized products. They do have some baskets closer to $50 with more products, but they contain very small-sized items. $50 to $100 – More baskets fall into this price range and include meats and cheeses, full-sized products and a few have sampler-sized wines. $100 to $200 – Baskets are more robust in this category, but often creep closer to $200 to get more full-sized products or larger volume of sample-sized products. $200 and up – There are very few baskets at this price and they often contain gourmet cheeses, international products and wines. World Market’s gourmet brands and options are broad and can suit just about any taste – making them ideal especially if you are hunting down gifts for a foodie. For corporate purposes, World Market’s selection is great, but they lack the corporate offerings to make it worth it. So, individuals are more likely to enjoy the World Market experience. We like the gourmet offerings from World Market. Just like their retail stores, their baskets are designed to make you feel as though you have jumped into some epicurean dimension of the world where you live and breathe fine food products. We also like their cheap standard shipping, great return policy and how you can build your own basket. The selection can be scarce looking in comparison to other online gift basket vendors – sometimes insufficient for some sentiments and holidays. We also take note of how much smaller baskets are and how many contain what appears to be a sampler-sized product instead of full-size – while for the price, most other companies offer a few full-sized items. 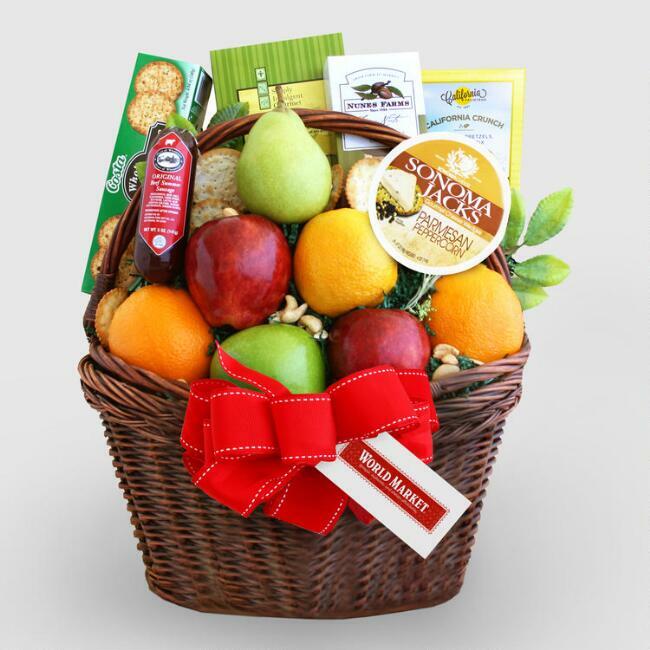 A gift basket company rich in culture and fine foods. World Market’s Gift Baskets are ideal for the gourmand looking to expand horizons and even expose friends and family to limited edition fine food products. Under $50 - The gift baskets under $50 are few and far between and most contain only a handful of items, such as a coffee cup filled with sampler sizes or a miniature cheeseboard with sample-sized products. They do have some baskets closer to $50 with more products, but they contain very small-sized items. $50 to $100 - More baskets fall into this price range and include meats and cheeses, full-sized products and a few have sampler-sized wines. $100 to $200 - Baskets are more robust in this category, but often creep closer to $200 to get more full-sized products or larger volume of sample-sized products. $200 and up - There are very few baskets at this price and they often contain gourmet cheeses, international products and wines.